Unless you live right next to an active volcano, and in some cases even if you live right next to an active volcano, tapping Earth’s nearly limitless amount of geothermal power is not easy. You usually have to drill through hard volcanic rock, which is slow and expensive. Or at least, it is if you’re not using a frikkin’ laser drill, which they totally have now. Foro Energy has been working on a drill that uses a nearly weapons-grade fiber optic laser to augment the power of more traditional drilling equipment. They can set the laser up above ground, and then fire it through a skinny little fiber optic cable a mile long so that it blasts out underground where the drilling is going on. 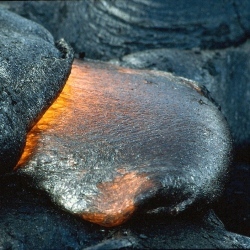 There, the laser heats up rock so fast that it immediately fractures due to thermal shock, making it easy for a conventional drill to rip it out. The benefits of adding the laser are most pronounced when drilling through extremely hard types of rock like granites and basalts. Thanks to my degree in geology, I am allowed to inform you that both granite and basalt are igneous rocks of the sort that you’re likely to find in close proximity to a volcano or other geologic hot spot, which has made boring geothermal wells time consuming and spendy. The laser, however, makes things ten times more economical, which looks like it might just be economical enough to actually be economical.